Thousands of people shelled out thousands of dollars to attend Fyre Festival, billed as an exclusive gathering of musicians, models, social media stars and swimming pigs on a private island in the Bahamas. The reality: transport delays, rations, disaster-relief tents, cancelled acts, feral dogs and unmitigated chaos without a celebrity in sight. The blind rush to buy tickets is a classic example of people falling for fool's gold. The reasons for the festival's failure continue to emerge. Its organisers - led by musician Ja Rule and entrepreneur Billy McFarland - reportedly spent millions on celebrity endorsements and marketing, but neglected to pay vendors, musicians and staff. They began planning less than two months before the kick-off date, ignoring warnings that showers and toilets wouldn't arrive in time, and apparently failed to pay customs duties. They now face a trio of class-action lawsuits from disgruntled ticket-holders, and the prospect of stricter vetting for a planned do-over in 2018. Fyre Festival's attendees join a long list of people who've fallen for alluring illusions. A Scientific American article from 1872 tells the story of a man who married a widow for the hill of sparkling rocks she owned, only to discover it was made of pyrite, also known as fool's gold. Like those who snapped up tickets for Fyre Festival, he leapt first and looked second: he made a large investment to secure something that looked valuable, without confirming its actual worth. The instinct to race like lemmings over a cliff edge, rather than stop and appraise the climb down, stems from a manic desire to beat others to the prize. Humans have hurtled headfirst into uncertain but coveted territory for more than a century, so it's unsurprising they continue to do so. Take Kylie Cosmetics, which received scores of customer complaints about unusable lip-gloss wands, headache-inducing smells from eyeshadow palettes and other problems in its first year. Yet the company boasts that products sell out within minutes, even though the brand's sole indicator of quality is its affiliation with celebrity Kylie Jenner. Indeed, a blogger pointed out Kylie Cosmetics' formula was almost identical to far-cheaper ColourPop's. More factors are at play now than back in 1872, such as Ja Rule and Kylie Jenner leveraging their influence on millions of people through social media. But consumers are still driven by visions of grandeur and exclusivity, desire for social standing and fear of missing out (FOMO), which whip them into a buying frenzy - not unlike participants in the gold rush. The founders of Fyre Festival preyed on these impulses. They knowingly marketed the event as something it was not and failed to disclose the bleak reality to attendees before they arrived, making them true purveyors of fool's gold. 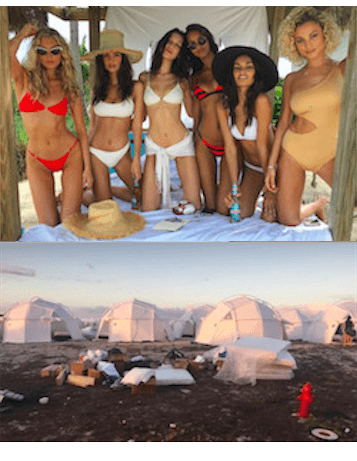 Fyre Festival didn't amount to much, but the debacle offers one important lesson: being circumspect costs nothing, and most things that glitter aren't gold.